No surprise again this month that the RBA has left the cash rate unchanged at 2.5%. Lucky we give you more to read than just a rate announcement – otherwise I’m guessing we’d end up in the delete box more often and more quickly. Just because rates are low, it doesn’t mean we should stop thinking about how we can pay off our debt sooner. 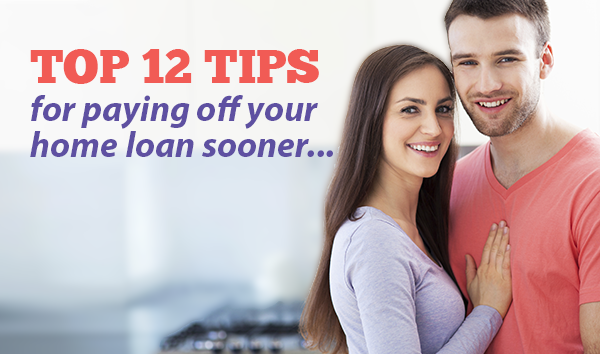 We always recommend paying off your store and credit cards first, however if you want to knock down some serious debt on your home loan, then we have a dozen tips for you this month. We hope you get at least 1 new idea to help you on your way to earlier home ownership. What about some others that we often don’t think about? Instead of putting your spare cash into an interest bearing account where you earn very little interest and pay tax on the interest you earn, transfer any spare money you have into your offset account. The additional cash works to offset the interest you are paying on your home loan. If you are the type of borrower who worries about interest rates increasing but you don’t want to be tied down by a fixed loan, a good compromise is a split loan. Split loans allow you to fix part of your home loan and set the balance of the loan with the variable rate of interest. Essentially this allows you more flexibility knowing part of your loan is safely fixed and won’t move. If interest rates don’t go up (or if they rise only slightly or slowly) then you have the flexibility of the variable portion of your loan and can pay that component off more quickly. If you have made good progress by paying down your home loan, many lenders will allow you to use a portion of this equity for investment. Providing you can service the new debt, it is the most common strategy for wealth creation used in Australia. As long as you are being advised and guided by a reputable credit adviser or financial planner, this type of investment is usually a safe strategy to start planning your financial future. When you are fortunate enough to refinance and reduce your monthly repayments, rather than increasing your lifestyle or even paying down your mortgage, it is sometimes wise to invest the difference. We recommend you seek counsel and advice from a qualified finance specialist, like ourselves, before trying to figure it out yourself. Don’t waste the opportunity by making mistakes. There are many second tier lenders who provide excellent products and rates competitive to the BIG 4. As the competition for business is at its all-time high, it makes lending a very interesting sector to be working in. With a strong property market and low interest rates, there are plenty of opportunities being provided by alternate lenders willing to take on traditional lenders with low fees and very competitive products. There is always the temptation to let your mortgage roll along, make your repayments as they fall due and think as little about it as possible. This attitude could be your biggest mistake. It is important to keep yourself up to date with the property and finance market. We encourage all of our clients to have an annual review with us to ensure we have you in the best financial situation available at the current time. Rates change, new products are introduced and changes in the finance market itself may allow you to seize an opportunity or negotiate a better deal. Stay informed and ahead of the game by reading our updates and committing to regular finance reviews.